As we were making plans for our final week in India, we really wanted to find a way to visit the caves at Ellora and Ajanta – World Heritage Sites located in the state of Maharashtra. Until now, we have had it pretty easy always finding a direct train or bus to take us from place to place. Unfortunately it wasn’t so simple to get from Udaipur to Aurangabad – our base for visiting the caves. As Dave likes to say, we had to go around our elbow to get there, first taking a 6 hour bus trip to Ahmedabad, then spending the night and organizing transport onward to the caves for the following day. The latter turned out to be a 17 hour trip in the top sleeper bunk (more like a sardine can), over the rear wheel of an old bus with little (or no) suspension that all too frequently took detours down dirt roads. Though I wouldn’t choose to repeat the journey, it was worth the trip around our elbow to visit the caves. The 30 caves of Ajanta are Buddhist temples and monasteries carved out of the rocky hillside overlooking a river (which was dry as a bone at the time of our visit). The caves were built from 200 BC t0 650 AD but were “lost” until the 1800s. Several of the paintings on the walls and ceilings of the caves are remarkably still in decent condition. 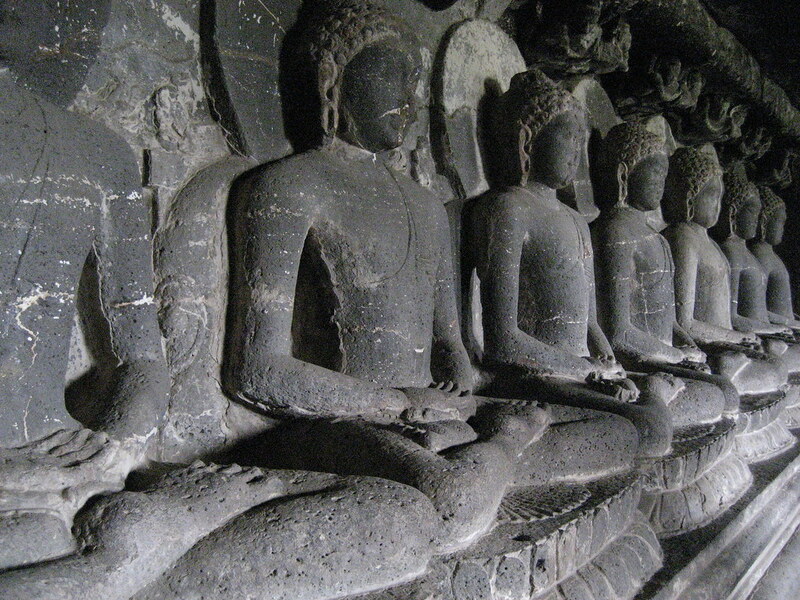 Both the paintings and the sculptures at Ajanta are considered “masterpieces of Buddhist religious art”. The caves at Ellora were just beginning to be carved into he walls of a basalt cliff as those at Ajanta were being completed. Ellora’s cave temples and monasteries represent Buddhism, Hinduism and Jainism and are thought to demonstrate the religious tolerance of that time. Though they were all impressive, the awe inspiring highlight of Ellora is the Hindu Kailasa Temple. The view from the cliff above the temple offers perspective on the grand scale and ornate detail of the Temple. We tried to imagine what it was like to cut something so elaborate with a chisel and hammer and probably not see its completion in your lifetime.